Welcome back to, "Why on earth am I doing this, again???!!!" 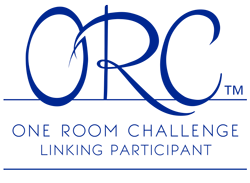 That's right, I felt I needed to enter the One Room Challenge to keep me on target with my living area's decor! It's week 2 and I've been a BUSY body! I've been moving about just like a cartoon Tasmanian Devil tornado! If you remember, from last week, I have this obscene extreme "laundry list" of things to do; one of which is to have 14 pieces of furniture upholstered by a professional who says he can complete the work in less than 2 weeks. I know, I know- I've GOT to believe! Please, don't shake your head or laugh at me! I've been quite productive! 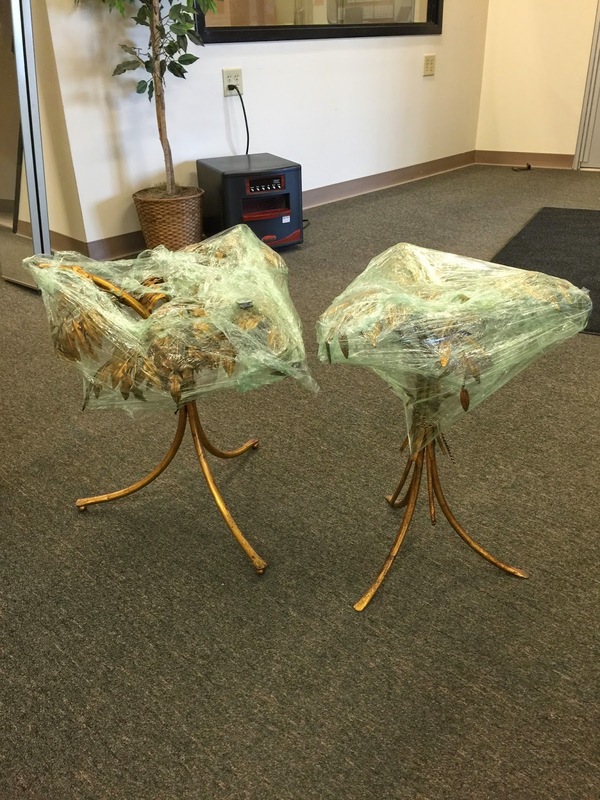 The upholsterer picked up the furniture, my delivery guys dropped off the metal cabinets to the sandblaster, shopped for lampshades, and ordered glass table tops for a pair of end tables. Did I mention that according to MY plan, I'll be moving my load, from Chicago to Duluth, at the end of next week??? These photos of my 300 sqft. storage unit were taken AFTER we (my friend, Michele, & I) moved the 17 pieces of furniture to be upholstered (I'm using 14, selling 3) out of it. I forgot to take a photo before we moved the pieces out, but, prior to moving the furniture you couldn't walk in the unit! Here's my mix of furniture, coupled with the hope of, coming close to, achieving what my inspiration rooms have accomplished. First up, a bench, in the manner of Knoll, whose chrome I LOVE! I was considering keeping it cool with a sumptuous navy mohair, but now I'm thinking since it's cool by nature (chrome) perhaps I should warm it a bit with a antique gold (a little darker than the current vinyl w/a bit of iridescent) velvet. I have 2 of these coveted benches but will, for now, only be using one in the apartment and it may wind up in the bathroom or in my bedroom; I'm not totally committed to it being in the living room. 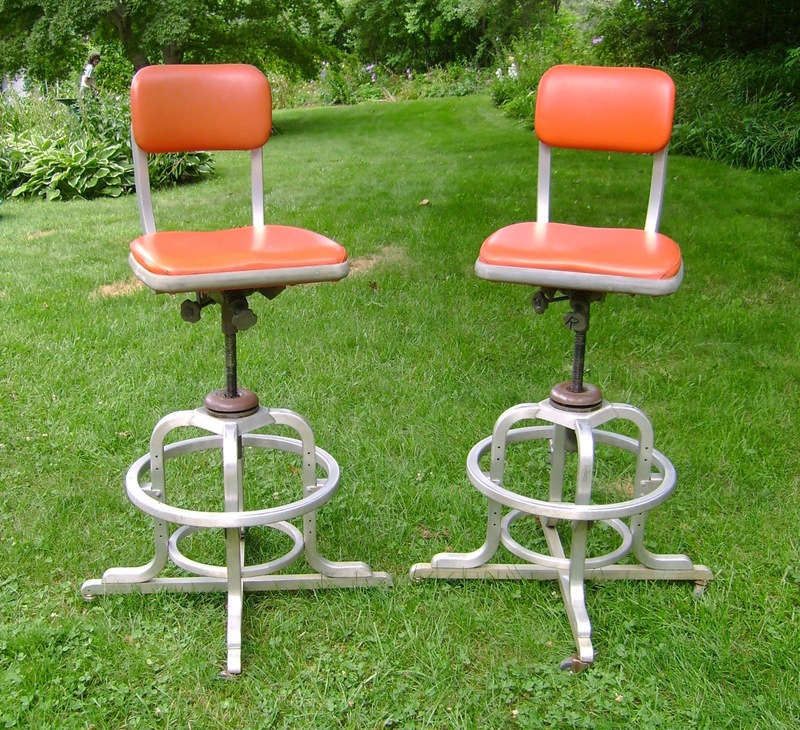 I LOVE these vintage Goodform stools!!! They are so mechanical. I stalked the eBay listing for 6 to 9 months before I ever made an offer. Every other day, I'd check to see if they were still listed. Once they weren't & I had a major upset for about 3 days until the seller relisted them! I considered doing this to the stools, but, I remembered the genuine navy patent leather hides that've I've had since '08 and think it'll be a really cool look. If, in the future, I change my mind and want a more rugged, industrial look I'll have the upholstery removed & the seats polished. This pair will be positioned in front of the stainless steel work table/island in the kitchen area. 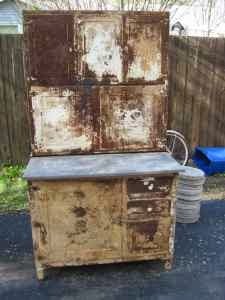 I wish I remembered to take a photo of this Bertha Schaefer bench prior to the upholsterer stripping it! Had it not been for the stain on it I probably would have kept the original fabric it was a wonderful multi-shade of yellow & white; I think it was a Jack Lenor Larsen fabric- VERY textural. I returned to his workshop to take photos of it the, next day, & he had already begun the process. Bertha Schaefer was one of the rare female furniture designers during the Bauhaus and mid century eras. She's not as widely known as Ray Eames, Florence Knoll, or even Eileen Gray for that matter. I purchased this piece not knowing it was a Schaefer or knowing anything about her. The bowed legs, in particular, signaled me that the bench was a special piece. I have something fantastic planned for it. See more of Schaefer's designs here. Another favorite piece of mine is this vintage settee. It's the perfect size (48")- not to big, not too small. I've sold at least 10 of these, over the years, and always buy one whenever I come across them. I currently own 2 and will have this one stained a little bit darker, just to bring out the richness of the wood. They'll be no tufting, just a clean tight seat. No bolsters, either, just throw pillows. It may look frail, but, this bench can hold substantial weight, like 400+ lbs! Wolfgang Hoffmann... He MADE me fall in love with him. His design of this Art Deco era bench is so modern and timeless. I tried to resist him, especially since he lived 2 hours away... When I first saw the bench I knew what I'd use to recover him in, even though I did not yet have the upholstery. One spring, while I was a vendor at the Randolph Street Market, in Chicago, a lovely couple (also vendors) were complimenting my furniture and accessories for sale and asked if I sourced pieces. 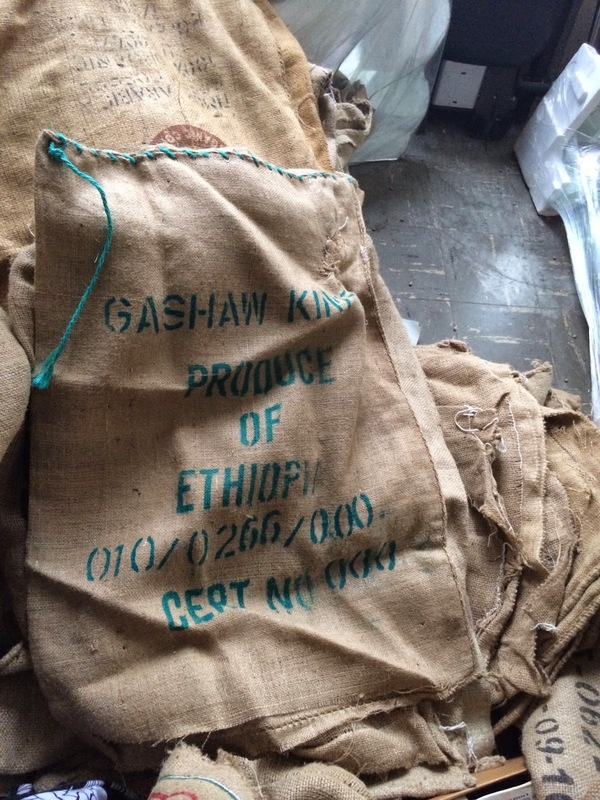 Sourcing is one of my favorite things to accomplish. My friend Ted, calls me "The Bloodhound", because, if it's out there I can find it! Well, the wife described, in detail, to me the design of the curved wingback chairs for which she had been unsuccessfully hunting; she called them "angel-wing" back chairs. She and her husband were cowhide rug dealers and whenever they could find the angel-wing chairs they'd have them upholstered in a hide and would quickly sell them. She mentioned that if I was able to locate the chairs she'd be willing to barter with a hide of my choice!!! My heart quickened! I knew EXACTLY what I needed in terms of size and color, I quizzed her and her husband about my specifications, and within 7 days she had her pair of heavy, vintage angel-wing chairs. She was shocked! I got my hide! Guess which piece it'll grace? 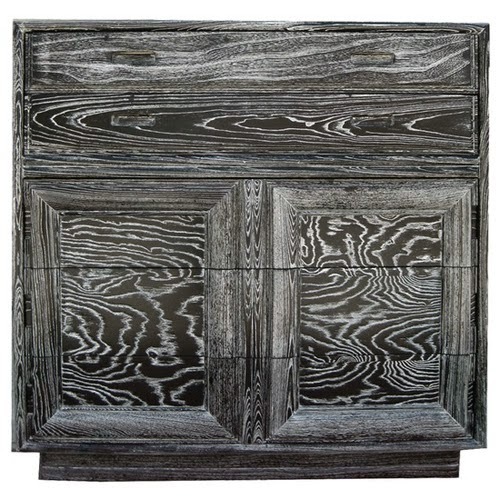 I love this ottoman (as you can see, I love all my pieces!) and really think its legs need a tan! Perhaps, espresso, to make them look rich. I've got a project in mind for this pair! It MAY not get accomplished w/in the next couple weeks so, you'll have to stay tuned to see how they turn out. 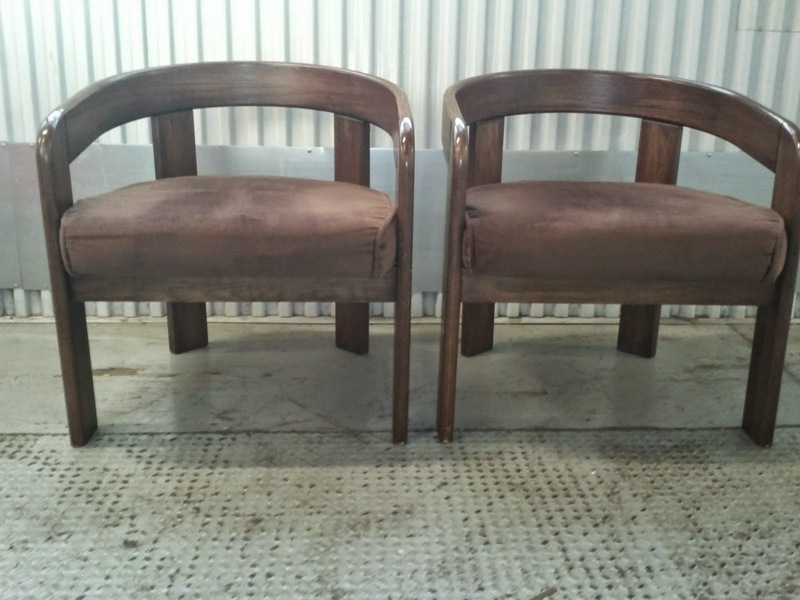 This particular pair of vintage chairs remind me of an Afra & Tobia Scarpa design. I have BIG plans for them! My idea is to use a white and black speckled cowhide & ceruse the oak. The grain is ripe for cerusing; they will look like they're out of the wild! My petite darling Chiavaris. I'm having 2 chairs upholstered. The plan is to go for something rough, rugged, and a bit industrial on this glamorous pair. 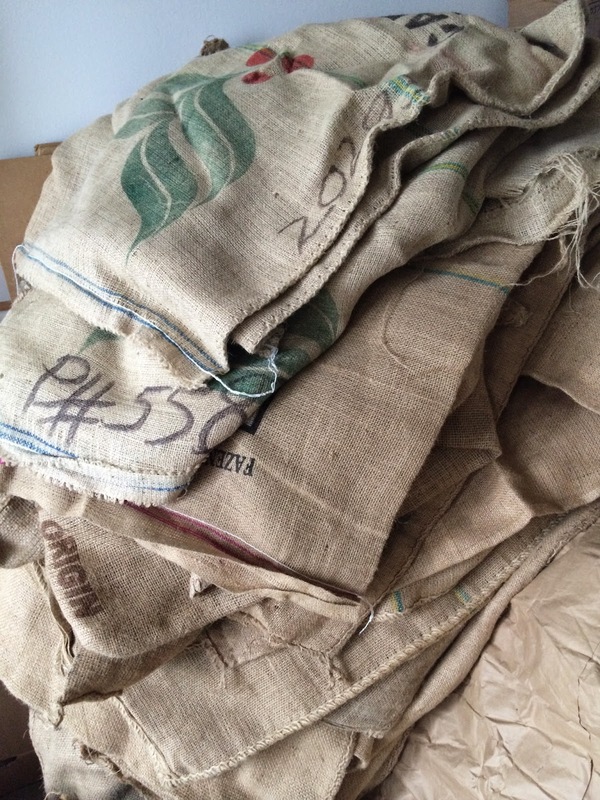 I've got THOUSANDS of burlap coffee bags from around the world! Well, certainly hundreds! I collected them for several months from a coffee company in Chicago who was giving them away! My dear Shana, was so generous with giving me as many bags as I wished- she'd even sit aside some of the most special, graphic ones aside for me. 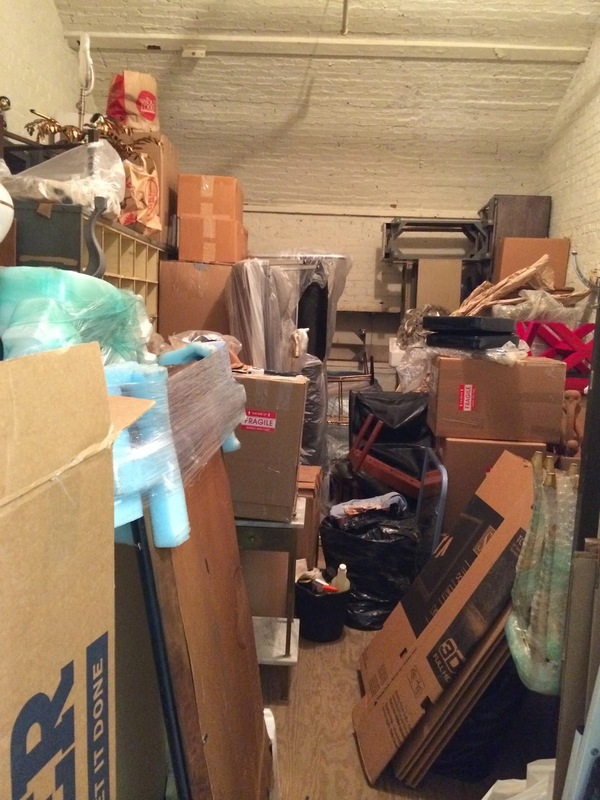 Of course, I gave tons away- many to a fellow furniture dealer in Chicago who upholstered furniture with them, many to a friend who uses them as props when she displays her wares for sale, and many to my dear friend Ted who's designing a line of burlap tote bags with them. 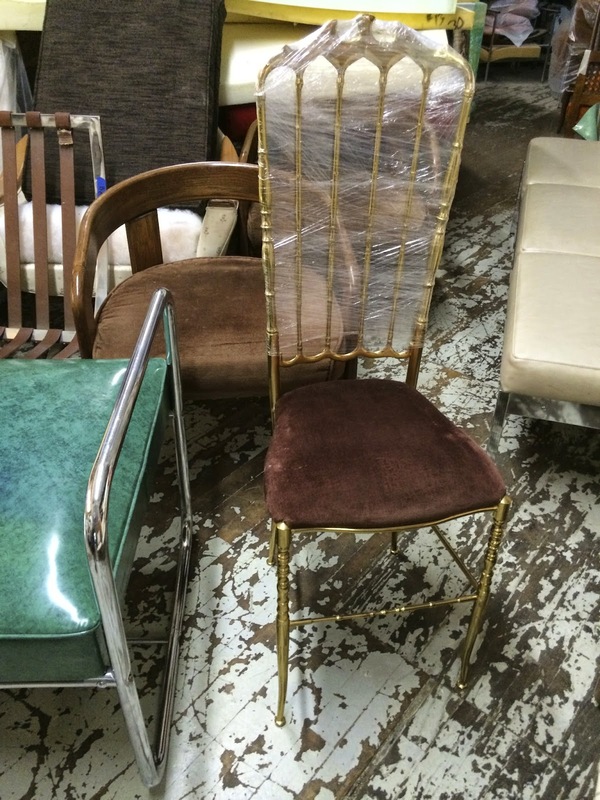 Mr. Upholsterer seemed really intrigued with the notion of upholstering the dainty and classic Italian brass chairs with burlap. The pride of my lot, my LABELED Milo Baughman ottomans. Scroll down to my inspiration room to see how Madeline Weinrib interpreted them. Well, I love the stools but HATE the color! I considered dying them black or navy, but, the fabric IS original and my only hesitation to upholster them is because they are covered in a wool kilim!!! Can you believe it? That's THE only reason. I told the upholsterer to just hold them aside and I'd let him know. Well, it's been a week and I haven't committed to recovering them yet. I already ordered & received a rug that, I think, will compliment them the best, as they are. What do you say? To recover or not to recover??? 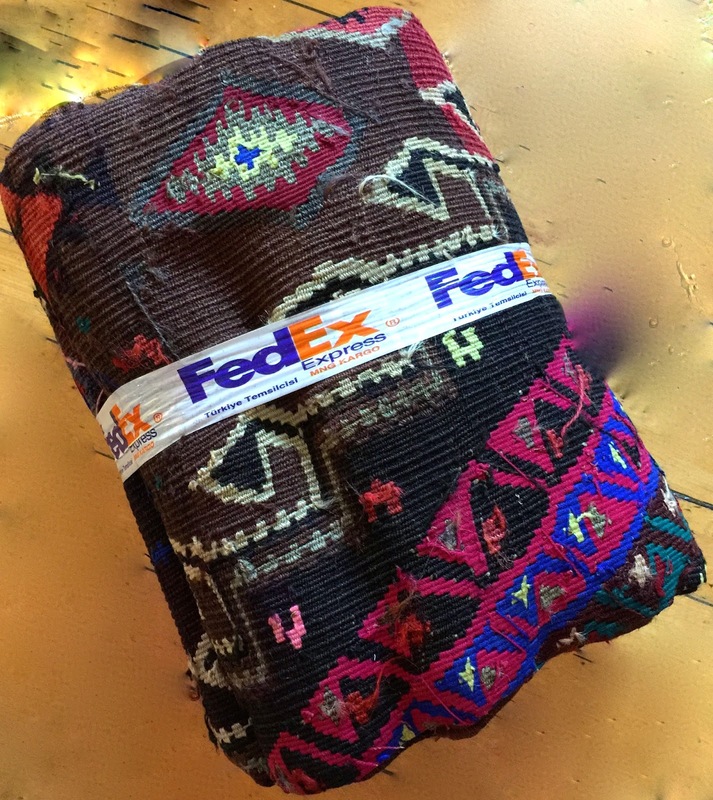 Believe it or not, I ordered a kilim rug from Turkey via an etsy seller and it arrived in LESS THAN 48 HOURS!!! It's the rug I selected to balance the rust colored Baughman stools and it is FABULOUS! I have a sinking feeling that the glass table tops, that I ordered, may be the wrong scale for these end tables to flank the sofa. After further consideration, I think the dimensions that I ordered won't be substantial enough, nor look as high-end as the tables are. Oh brother! In all honesty, budget and time constraints prevailed. I cannot afford the time required to have the table tops sent to the company's laser and bevel cutter out of the city. Plus, I'm choosing to avoid using over $500 of my budget on table tops. A rug, yes! My cost came in at $51 (total), however, I think they may look like $51 table tops! I can always upgrade, in the near future. The following metal cabinets were delivered to the sandblaster. We shall see if I'm able to polish them in time for the unveiling. I am totally at peace with the prospect of completing their restoration at a later time. I drove from Chicago to St Louis just for this dental cabinet; it was priced far too incredibly for me not to make the trip! 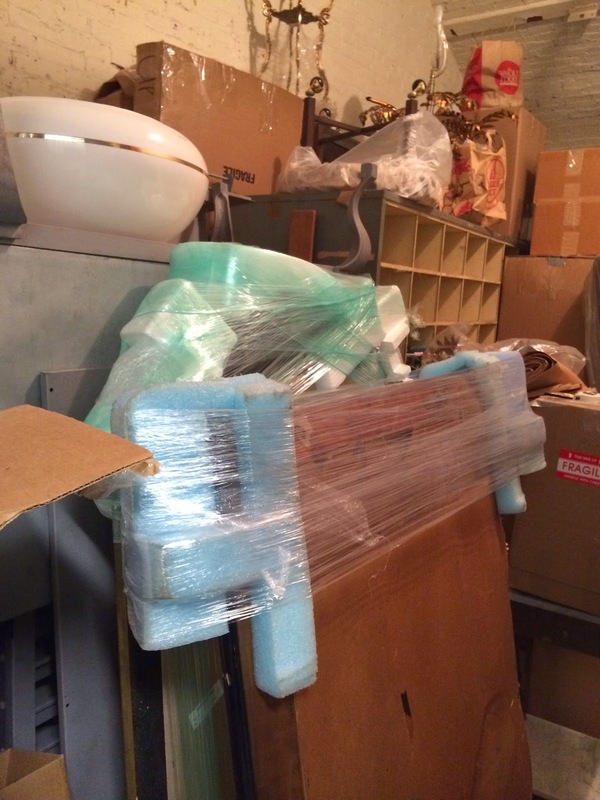 You know I always have a great story about locating a piece. 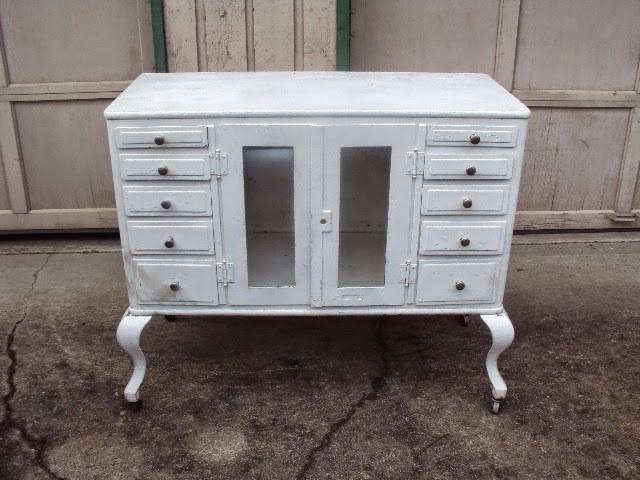 I wanted one of these medical cabinets for YEARS and this one fell into my lap! 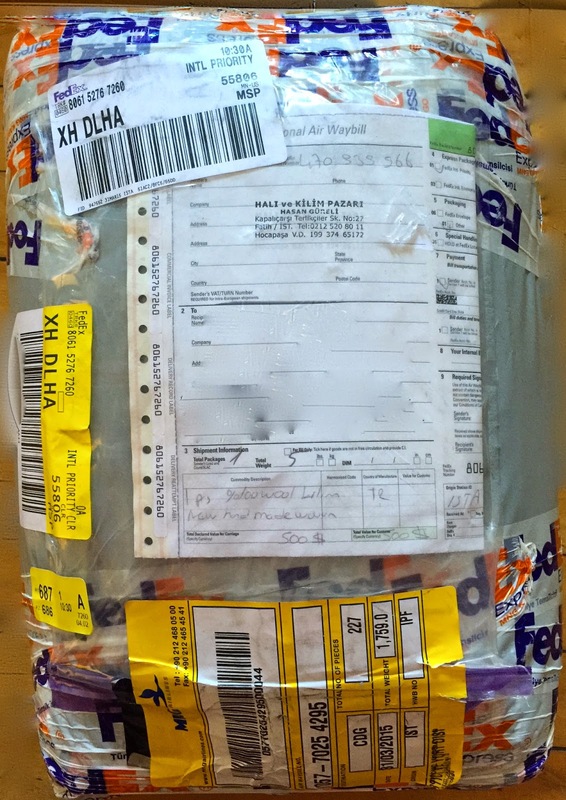 I had it shipped from Seattle and must share the story in a later post. 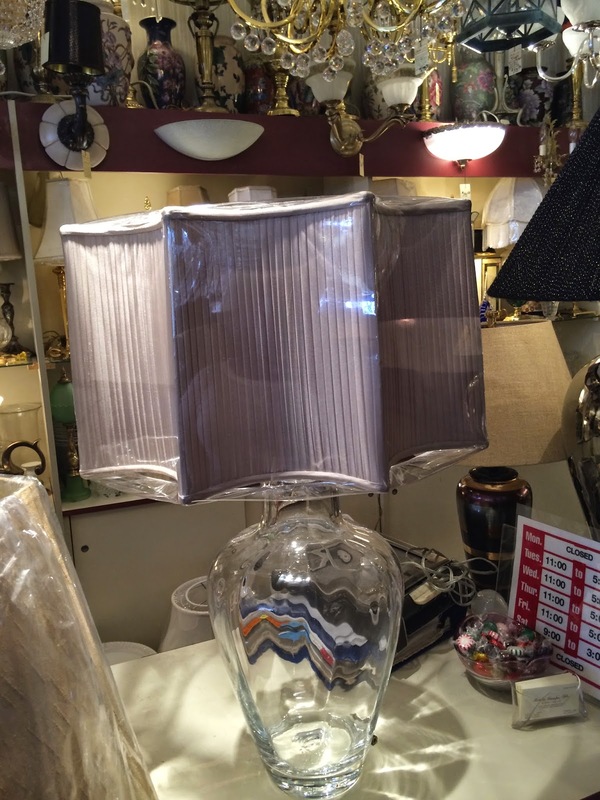 Traveled to the lamp shop and since I wasn't attracted to any of their fabric selections I've decided to have shades custom made- so excited! 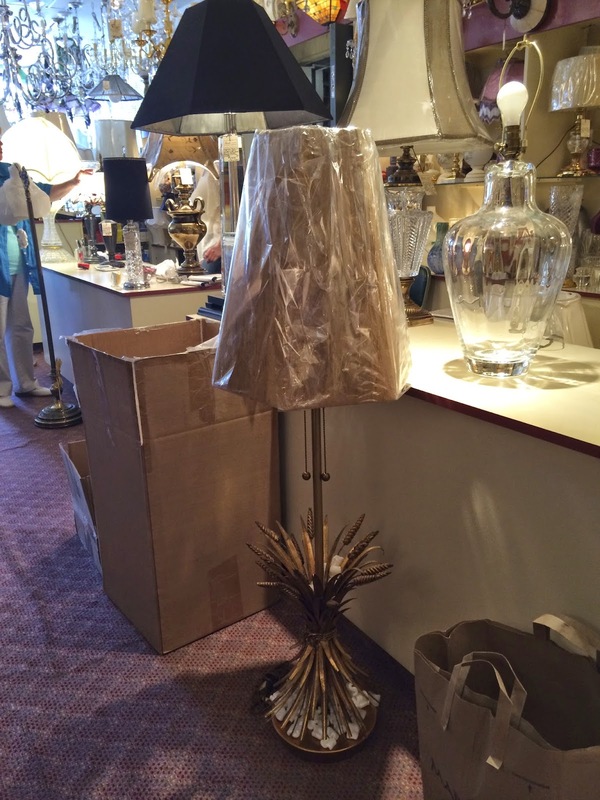 I wanted a plain cylindrical drum for this Italian tole sheaf of wheat lamp, but, when the owner's wife topped the lamp with this hexagon shade I fell in love! I've decided to raise the height of the lamp. 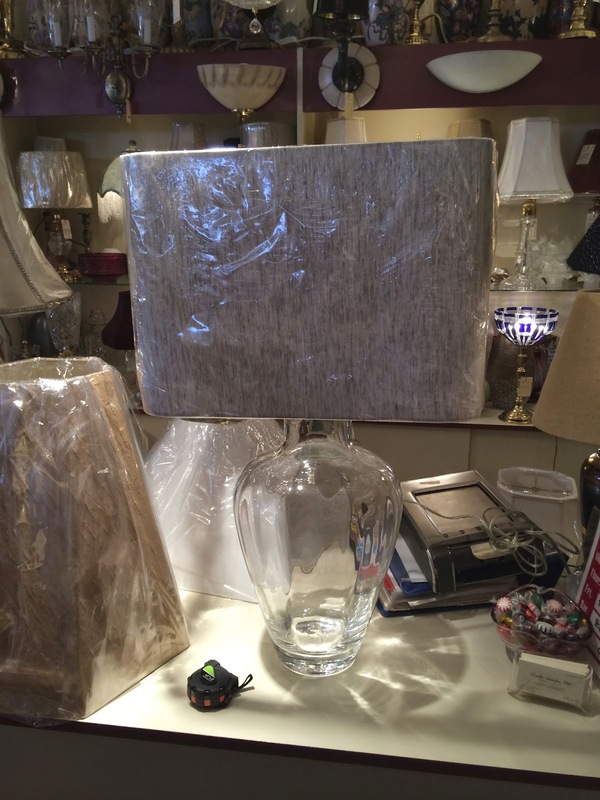 Apparently, in it's current state, it's a table lamp. This shade LITERALLY took my breath away- OMG!!! You can't even tell, from the photo, how utterly breathtaking it is. Custom made, hand pleated silk, scalloped octagon- oh my! I don't think it's right for my Simon Pearce lamps but I just couldn't resist styling them on my lamp. The sumptuous fabric and the immaculate hand craftsmanship makes the $800 price point understandable. I need opinions about this shade. What do you think? This particular size is too large for the lamp, however, I'm attracted to the irony of the shapes and how well they coincide. Please share your thoughts. If I select it, I'll have to provide the fabric, ASAP! From this shot of the room, you can see how successful the glass (invisible) coffee tables are in creating a fluid, undisturbed sight line- the designer truly understood that the rug was far too sensational to be covered by a solid table. The conversation piece rug (when it's that large, is it a carpet?) is a stunning palette on which the decor of the room was developed. Extracting aqua, from the rug, as the color choice for the curtains was the right accompaniment and the best compliment to the dark tones of the antique club chairs and the ottomans. Madeline Weinrib has the same elements in her living room: white walls, light colored oversized chair, dark leather club chairs, "invisible" (chrome, glass & lucite) coffee table. Although Madeline's room doesn't pull in the full spectrum of colors, it's successful due to the movement created from the chosen textiles. Brown, beige, or tan rooms can often be sedate or stagnant, leaving one to feel a lack of dimension to the room. The black elements, specifically, have created movement in her living room- the black side tables, the black in the beige/cream rugs, the use of black in the khaki horizontal stripped throw featured on the arm of the oversized chair, and one of my favorite elements of the room- the black and white mid century upholstered side chair. Madeline and I have similar taste in seating, she, too, has a pair of the Baughman stools (fabulously recovered, of course! ).